The main options screen of the drum box application are shown below. 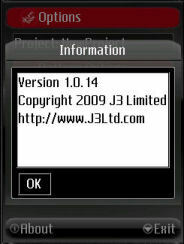 The name of the project currently open, "NewProject" is displayed above the first button. Pattern Options opens up a new set of options regarding patterns: edit a pattern, it's name and beats, drum kit. 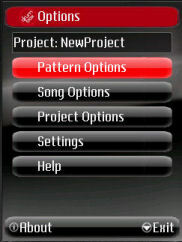 Song Options opens up a new set of options regarding the project's song: edit the play order, play the song, export as a Midi file. Project Options opens up a new set of options regarding projects. Load, save, delete, save a copy. Settings Options opens up a new set of options to set the tempo, accented and normal note volume, whether the pattern editor should be silent or not. Help displays a sumary of how to use the drum box application. The menu's About option displays information about the drum box application, including this website's URL and the version number of the drum box application being used.